Be the first to share your favorite memory, photo or story of Kaitlan. This memorial page is dedicated for family, friends and future generations to celebrate the life of their loved one. 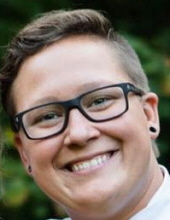 ALEXANDRIA, IN- Kaitlan KreAnn Krupke, 30, passed away on Saturday, February 9, 2019 unexpectedly in her residence. She was born on July 18, 1988 in Anderson to Tamara Woods. She was a graduate of South Decatur High School-Class of 2008. Kaitlan had worked at the Pendleton Juvenile Correctional Facility for 3 years. She was currently employed by Elsa Corporation in Elwood for the past 2 years. She enjoyed sports, and was a fan of the Chicago Bears and Chicago Cubs. She liked reading and watching crime TV. She was preceded in death by her best friend-Jeremy Richardson, her maternal grandfather-Jack Woods Sr.
Services honoring Kaitlan’s life and legacy will take place at 7 pm on Wednesday, February 13, 2019 in the Owens Funeral Home, 412 North Harrison Street, Alexandria. Cremation will follow the services. Friends may call at the Owens Funeral Home on Wednesday after 4 pm prior to the services. Memorial contributions are suggested to the Owens Funeral Home to assist the family with final expenses. This can be directly done by going to the website www.owensmemorialservices.com, clicking on Kaitlan’s obituary and clicking on the “Donate Now” button. Owens Funeral Home is honored to care for Kaitlan and serve the Krupke/Woods family. To send flowers or a remembrance gift to the family of Kaitlan KreAnn Krupke, please visit our Tribute Store. "Email Address" would like to share the life celebration of Kaitlan KreAnn Krupke. Click on the "link" to go to share a favorite memory or leave a condolence message for the family.